Happy 2019 to you all! New Year’s Day for me was more about celebrating finishing my latest e-book. And now that that project has been put aside , I am back at my loom and working on a large piece of fabric. This will be sewn into a shoulder bag. Don’t ask me what shape or form that will take. I am not skilled at sewing and I’ll have to figure that out later! I have worked on this for more hours than you might imagine. If you compare the first and second pictures, you might notice that the green stripes that flank the center pattern are missing in the second picture. They were begging to be removed and so I spent one evening un-weaving back to the start and cutting them out so that I could get up the next morning to a fresh warp and pretend it never happened! That left me much happier with the project. Of course, I will be finishing the cloth with decorative stitches and tubular band edgings. How could I not after finally getting the instructions down in my latest e-book, The Eye-pattern Tubular Band and Other Decorative Finishing Techniques. This bag will have a built-in pocket. If you look closely at the picture above, you will notice that I began by weaving across the whole width of the cloth. Now I am only weaving the center section. 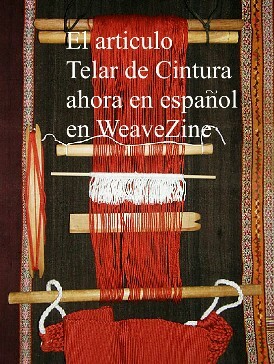 You can see that the weaving there has advanced far beyond the side sections. In that center section the warp is longer than the two side sections and this is what will form the pocket. This is the warp for the black pocket bag that I recently wove. You can see how the center section of warp extends all the way to bottom of my bed, which is my usual anchoring spot for my warps. The two side sections don’t extend that far. They are suspended on a separate beam which is extended on rope (my lovely braided llama-fiber rope from Peru :-)) away from the bed. I guess for me that is the trickiest part of the set-up….having the two shorter parts of the warp sitting at just the right distance from the bed so that tension is exactly equal the whole way across the three sections. That involves a lot of sitting in my backstrap to feel the tension across the warp and then laying the warp down so I can go to the far end and guess how much the rope needs to be adjusted…back to my backstrap….back to the far end, another minute adjustment…and so on! You can try to feel for tension differences all day and night but they will only really show up once you start weaving. 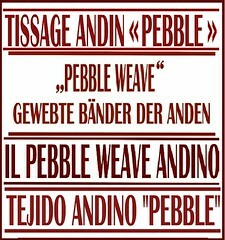 Ridging, or corrugation, in the plain weave is the warp’s way of telling me that it is unhappy! It was a lot easier to equalize the tension when I learned this technique in Potosí, Bolivia back in 1997. We used a horizontal ground loom and wove a very small piece. Adjustments were made by simply shifting a stake within easy reach that had been whacked into the ground. My teachers Julia and Hilda discussing how to create the warp that includes the pocket. It had been many years since either of them had woven one of these bags. I wanted the pocket on my current project to be 10cm deep. That means that the center section of warp is 20cm longer than the rest of the warp. I wove the center section, as I am doing in the second photo in this post, for 20 cm. Then I placed the entire warp together on just one back beam, put the llama rope aside, and anchored the beam directly to my bed as I normally do. The long piece of pocket fabric then gets pulled toward me and folded back and out of the way so that I can continue weaving across the entire width of the warp once again. The next challenge is folding the pocket and somehow securing it so that I can once again put tension on the warp. 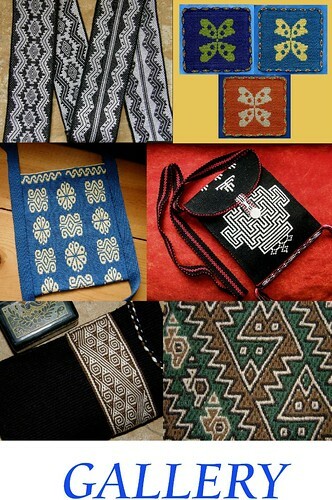 That was easy in Potosí when I was learning and relatively easy on the small pocket pouches that I have been weaving lately. In Potosí we just used a long needle and pinned it to the rest of the cloth. We were weaving with re-spun acrylic. It had a lot of twist added to it and it was tight and firm. Added to that was the hard beat on which my teacher always insisted. My cloth, like the yarn, was stiff and firm. I could just pin something to it and it would not budge. The 20/2 wool that I am using, on the other hand, has a bit of stretch to it and the cloth that I am weaving is not stiff. After trying many ways to secure it, none of which were satisfactory, I ended up using crochet cotton to sew the folded pocket down. The stitches can be removed once I have finished weaving. It’s a quirky little pocket. It sits on the outside of the bag and is accessed from the inside. I have been wanting to weave a large piece with one of these pockets for years. Now that the exciting pocket part is done, the rest of the weaving will be less technically challenging. Maybe some warp threads will break to provide some additional challenges…ha ha. Actually, that’s quite unlikely. I am not needing to do any strumming on this piece to get sheds to open and so the 20/2 wool should remain in excellent shape. The bag will be 30cm long and so I am quite near the half-way point where I can start working on what will be the back. 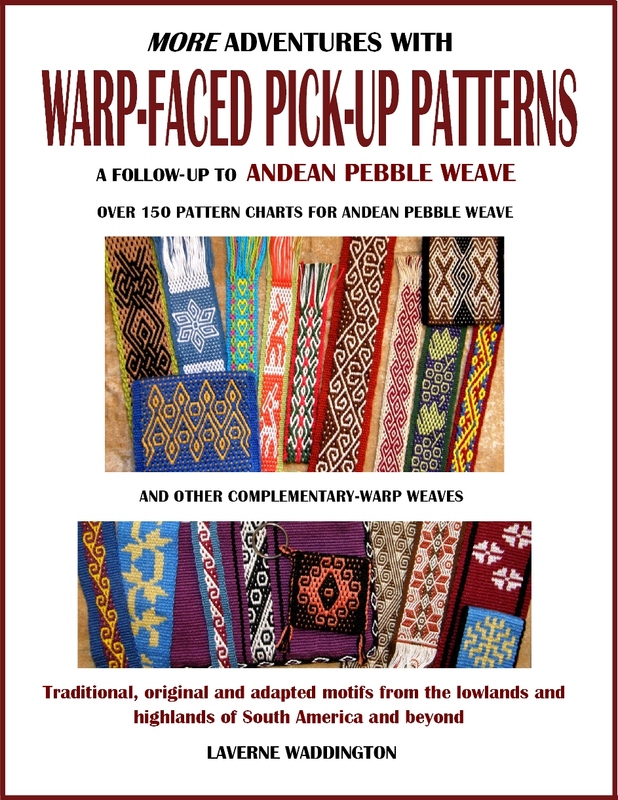 These patterns, by the way, are all charted in my Complementary-warp Pattern Book. I am also working a bit on another book while I weave this piece (I have a lot of started book projects on my laptop!). I am actually always working on something like that when I am not at my loom. 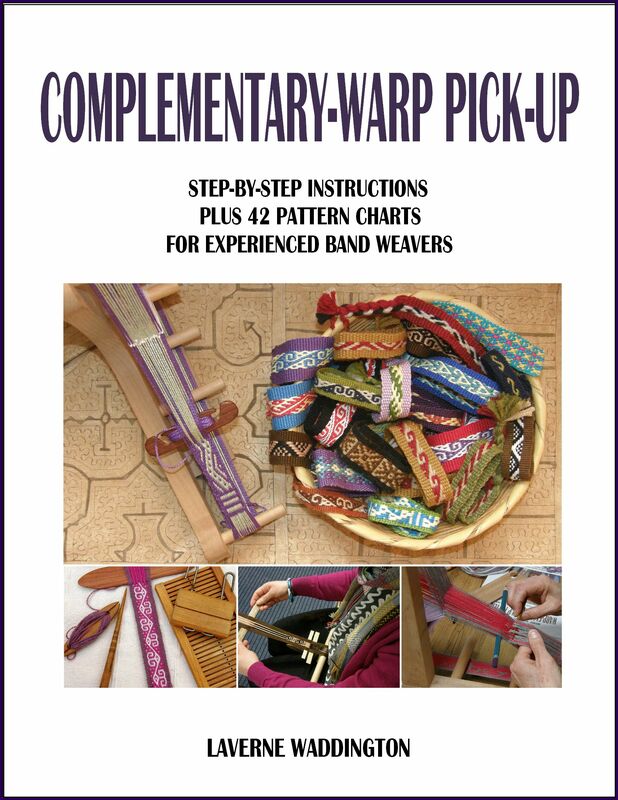 I have seen a few eye-pattern tubular bands being woven in my online groups since I launched my latest e-book on the topic earlier this month. I can’t tell you how happy that makes me. Nancy, aka yarndragon, was the first to post a picture of hers which she made on her inkle loom.. I wonder who will be the first to post a picture of one they have sewn to cloth. I am pretty sure I know who it will be but I won’t reveal that here! But, you don’t need to wait until you have woven a piece of fabric to which you can attach an eye-pattern band. One of the happy discoveries I made while writing the book was that the tubular band can be attached very nicely to store-bought cotton cloth. I had actually planned this to be a sample that showed how light cotton cloth cannot support the spiraling energy of the tubular band when it is simultaneously woven and sewn to the edge using the weft as the sewing thread. Light cloth can buckle and get distorted with all that spiraling energy. The eye-pattern tubular band used to dress up a simple pouch made with commercial cotton fabric. However, after having folded the cloth to make a little pouch and seaming the sides, I was actually sewing to four layers of fabric and that was more than enough to support the tubular band. I had bought interfacing to use but didn’t need it in the end. I am very tempted to make a bunch of little pouches now as gifts using lovely Japanese cloth pieces that I bought at the indigo exhibit we visited as part of BRAIDS 2016. Tubular bands along the sides and cross-knit-loop stitching along the top are nice finishing techniques. The legs of the cross-knit-loop stitches completely cover the hem at the mouth of the pouch. The strap is braided ( a 4-strand round braid) and there is a simple snap closure in the center. The button, or rather, pendant, is just decorative. I pulled out examples of my eye-pattern tubular bands used as edging so that I could photograph them for my book. I completely forgot this quirky piece that I wove some years ago. It lives with my travel bags as I only use it as slip-cover for my laptop when I am traveling. Hence , it was forgotten and didn’t make it into the book. I made the circle shapes in ikat and then filled them in with pick-up patterning. The piece is edged with the tubular band as are the circles. My ikat circles which were quite round (I was very proud of them) got slightly flattened as I wove because silly me forgot to consider take-up! I am very fond of this piece because of its quirkiness and the somewhat unconventional application of the techniques I have learned to do while living here in South America. I love that I have created something that can travel with me everywhere. Knowing how to turn corners while attaching the tubular band is something that will open up even more possibilities for adding decorative finishes to bags and pouches. I have covered the various ways that the bands can be placed on these kinds of projects in the e-book and there is a tutorial and supplemental video clip on turning corners. Now I am thinking….wouldn’t it be nice to have a laptop bag with a pocket for the cable….hmmmm. Until next time I will leave you with a reminder of my new e-book…. 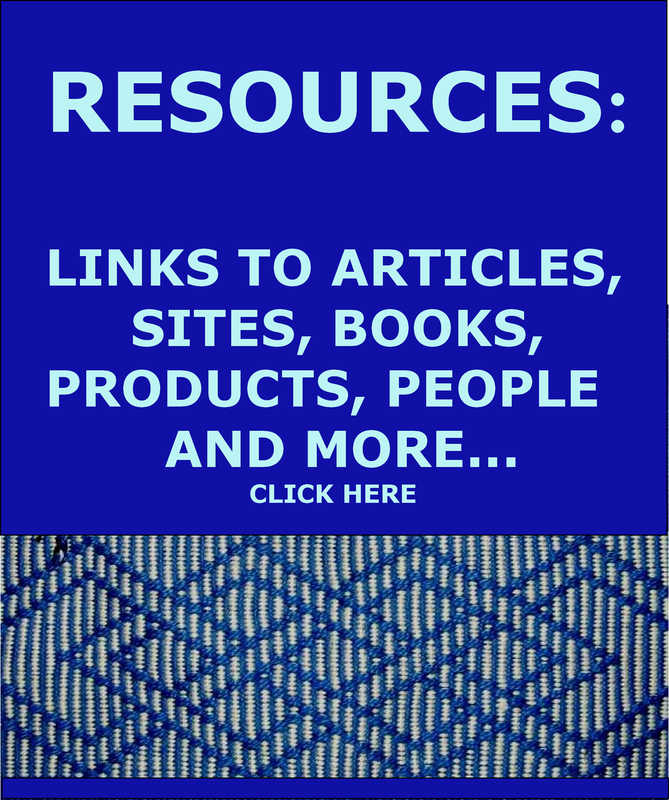 « Backstrap Weaving – A New Year and a New E-Book! How intriguing! I just started weaving the bag project using the brocade pattern technique that I recently learned. When I made the warp I added extra length so that I could make a small bag and learn the tubular band and attaching! So much to learn…. Thank you for the new book, would like to learn those techniques. Did you just push the warp together after cutting out the green. Your color choices are really good ! Hi Rita. I tie off each color independently when I wind my warps and so it was really easy to just cut out the green threads without disturbing anything and, as you say, push the surrounding threads together.